Summary : Such lofty expectations shattered on the rocks of reality - this tea tastes little of oranges or vanilla, but strongly of other fruit flavors. Review : When one thinks of orange groves, what usually comes to mind is endless groves or orange trees, with large oranges dangling from the limbs, just waiting to be harvested and to be made into orange juice, tea or anything else that requires orange. Combine "orange" with "vanilla", and hmmmm....all sorts of possibilities. Did someone say "Dreamsicle"? And so armed with this lofty expectation, I expected the world from Culinary Teas Orange Grove Vanilla Herbal Tea. And once again I ended up being reminded why it is never, ever a good idea to have expectations about a tea. I was expecting oranges, with a hint of vanilla - not unreasonably as the name of the tea suggests! And what I got, was, well, a "fruit tea", for lack of a better word. Like other samplers from Culinary Teas, this one was packaged in their "space age" light-proof resealable foil bags. I was very surprised to see the MASSIVE size of the pieces that are part of this tea. 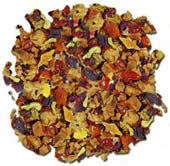 Then again, this tea is considered a "whole fruit" tea, and thus consists of "fruit pieces." The smell of the tea, though, was disappointing. Upon opening, you are greeted with a fruity smell - but not an orange smell as I was expecting. Still, I'm never one to judge a tea by its smell, so off I went to brew it up and see what happened. So what happened. Nothing exciting to report, I'm afraid. The tea has a very strong fruity taste to it, not all that different actually than Celestial Seasonings Tangerine Orange Tea. And that was disappointing! Really, this tea has a stronger blackberry taste than an orange taste. Actually, you can barely taste the orange at all unless you use your imagination a bit. And Vanilla? Well, if you can find the vanilla taste then you are a better person than me, as I had no luck finding the vanilla taste at all. Recommendation : This isn't a bad tea, but it certainly doesn't taste like oranges, vanilla or some combination of the two (aka - the "dreamsicle"). This is simply a "fruity tea" that has a strong taste of blackberries if my tongue isn't lying. Truthfully, blackberries aren't my thing....but maybe they are yours. Brewing Instructions : Pour 6-7 ounces of boiling water over tea pieces (tea consists of pieces of whole fruit). Let steep for 5-6 minutes. You'll need two teaspoons of tea pieces for a cup, due to the large, chunky size of the pieces.